One person was killed and 20 others, including eight policemen, were injured after clashes broke out between minority community and police force over thrashing of a couple in Ramganj, prompting district administration to clamp curfew in four police station areas and suspend internet services in the city. Curfew has been imposed in Ramganj, Galtagate, Manak Chowk and Shubhash Chowk areas. A petty dispute between a police constable and a motorcycle-borne couple late last night led to clashes between the locals and the police, following which the curfew was imposed around 1 am in Ramganj area, where the violence broke out. It is alleged that the constable had assaulted the couple over some issue, following which a mob of locals gathered around the Ramganj police station and indulged in arson, setting ablaze five vehicles, including an ambulance and a police jeep, and damaged 21 others. A power station was also set on fire. Police fired tear gas shells and rubber bullets to disperse the mob. 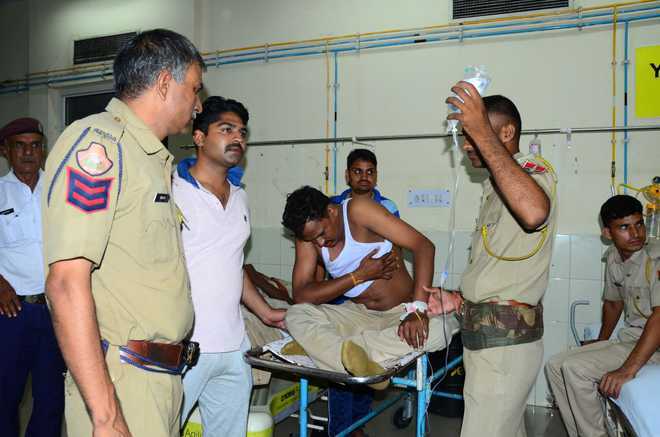 When the situation went out of control, police opened fire on the agitators in which one person, identified as Adil, was killed, ADG-Law and Order NRK Reddy told The Tribune. Adil’s body is lying at SMS Hospital's mortuary and his community people were adamant to lift it for rites, ADGP said. Five injured policemen were admitted to SMS hospital, while others were admitted to local hospitals. The Delhi-Agra route through Jaipur has also been diverted. Security forces, including Rajasthan Armed Constabulary (RAC) and home guard jawans, have been deployed in the voilence-hit areas.